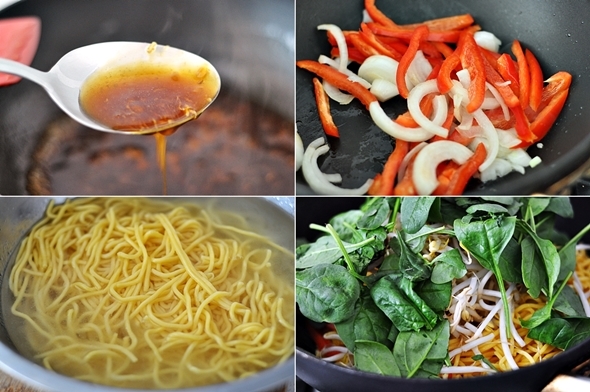 On my lazy days, I like to make stir fry using Hokkien noodles. For one, there are one pan wonder. I don’t need to cook rice separately in a rice cooker or boil pasta in a separate pot; secondly, it is down to a personal preference. I have a soft spot for cooking with Hokkien noodles. 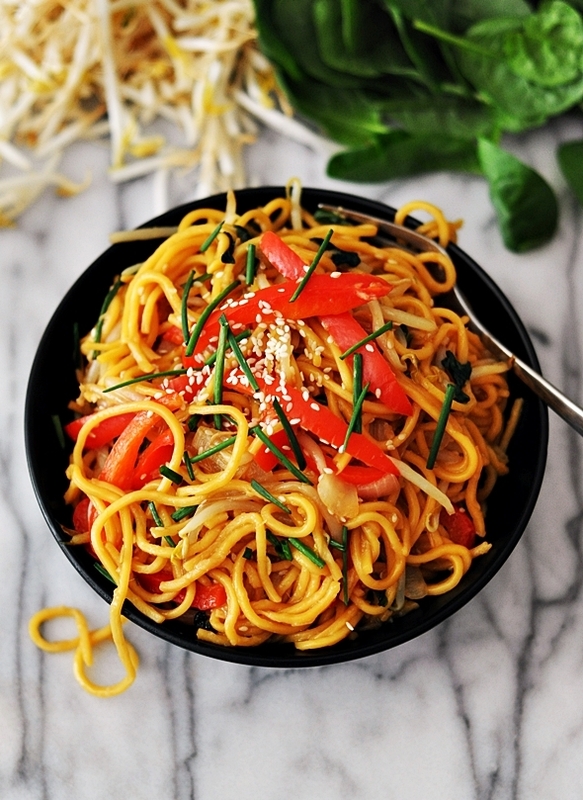 Usually, I will loosen the noodle strands by hand before cooking them – a trick I’ve learned when I worked as a waitress in a noodle shop. If the fresh noodles appear to be a bit dry (probably because they aren’t as fresh anymore) or like me, having an old fridge which turns any fresh ingredients into rock solid ice in the fridge compartment, all you have to do is to loosen the noodles by blanching in the hot for a couple of seconds. As for the teriyaki sauce, it was a simple concoction of grated ginger, white vinegar, brown sugar, soy sauce and sesame oil which was simmered until all the wonderful flavours are developed into the caramelly savoury goodness which we are all familiar with and love. While I use store-bought teriyaki sauce from time to time, I thought I’d also share my homemade teriyaki sauce ala fuss free cooking for those who love to make sauces from scratch.I hope you will like this recipe and happy cooking! 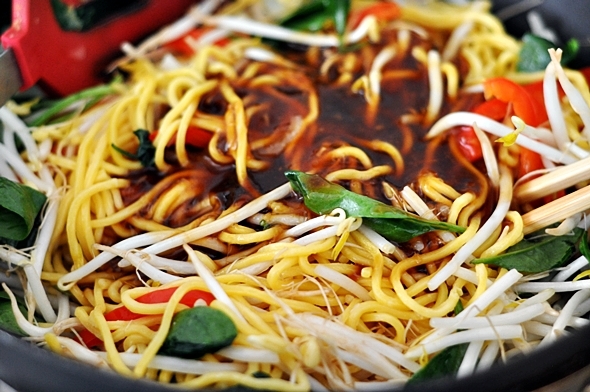 In a large stir fry pan, add soy sauce, brown sugar, white vinegar, ginger, sesame oil, water and cornflour. Switch on the stove and cook until the sauce is thickened over low-medium heat. The slower you cook, the more prominent the ginger flavour in the sauce but if you are pressed for time, you can make the sauce over high heat and boil until sauce can coat the back of the spatula. Check for taste and season with more soy sauce if required.Remove the sauce from the pan onto a bowl. Clean the pan and return it to the stove. Loosen the noodles by hand. If needed, blanch over boiling water, drained and rinse under cold running water. Set aside. Heat up cooking oil in the pan. When the oil is hot add sliced onion and saute over medium-high heat until translucent. Add capsicum and saute until aromatic. Add noodles and saute over medium-high heat until they are very lightly charred. If you blanched the noodles before hand, saute the noodles until the water is completely evaporated. Add bean sprouts and baby spinach. Saute until they are almost wilted. Turning the heat to very low, add the teriyaki sauce and quickly mix all the ingredients together (see note 1) and the dish is now ready to serve. [Note 1] This is because there's cornflour in the sauce, the longer you cook the sauce, the stickier it will become. The idea is to just add the sauce and mix everything together and that's it. 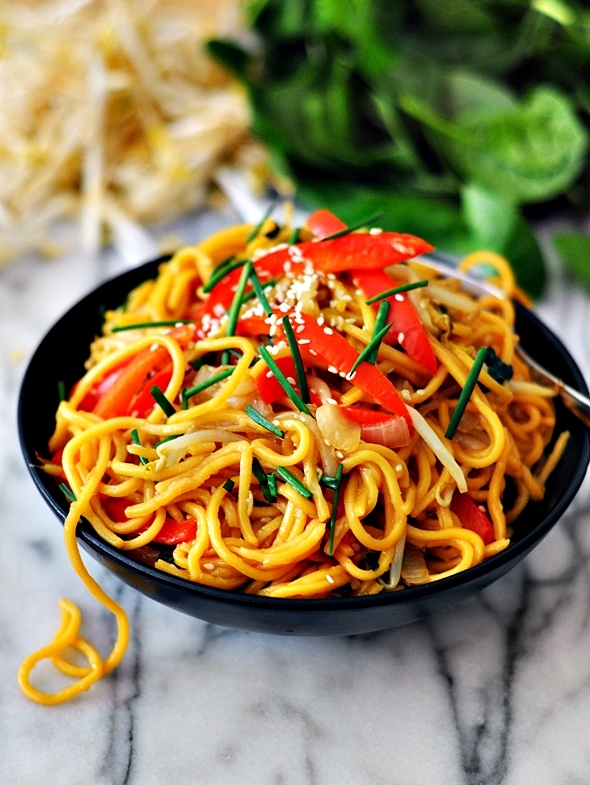 These are probably the best looking teriyaki noodles I’ve ever seen.. and I love my Asian food so I do have some knowledge in the matter! You definitely have got me craving a bowl right now – just divine. My family loved this dish. I substituted some veggies but the sauce was fantastic, a keeper!